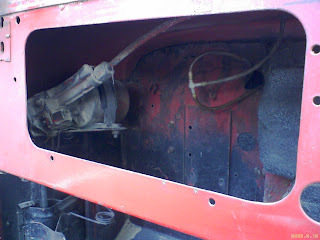 Here is how my Classic getting ready for operation theater. 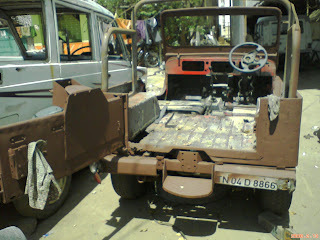 The pictures here shows the jeep after removal of dash board, electricals and seats. The platform is the major part that will be replaced during the operation. I think this is the time when the wiper motor can see light in it's life. See where is it fixed, this is the original fitting of viper motor the relay that goes from viper motor connects the viper blades in the external body. Just in case u are not aware, create an account in team-bhp forum. 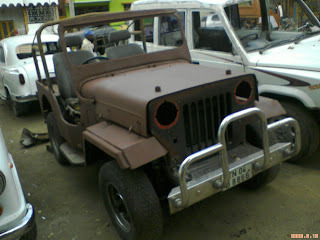 There are hundreds of Jeep/Classic enthusiasts , who will love to help you out in lot of ways. You may find help from Chennai itself, to procure parts and others. How much the work has progressed?? I'm a long time Team-BHP forum member but a silent user. Most of my questions are answered in Jeep Thrills group which is dedicated for Jeep owners and Jeeps. However I'm also a great fan of Team-BHP in many way.